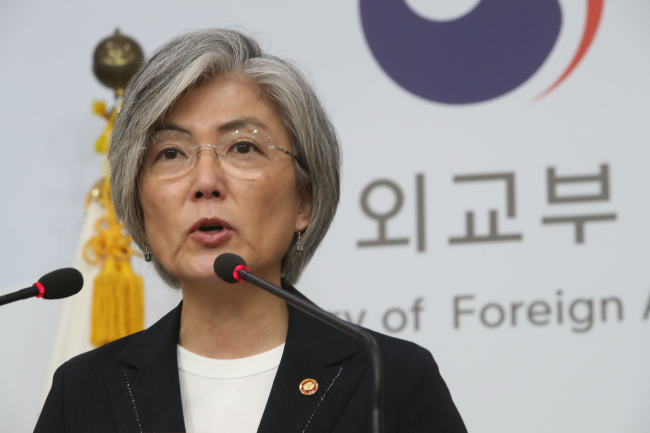 Despite unabated tensions, denuclearization talks with North Korea would be possible if Pyongyang refrains from additional provocations until its major holidays in October, South Korea’s Foreign Minister Kang Kyung-wha said Monday. After tensions hit a fresh high with the North’s second launch of an intercontinental ballistic missile early this month, recent signs of de-escalation from both Pyongyang and Washington are nurturing expectations for a “window of new opportunity,” she said. The Moon Jae-in government, meanwhile, will soon announce measures to squeeze the Kim Jong-un regime, Kang said, stressing the significance of tougher sanctions and robust security posture. “The possibility that another provocation will take place at any time, and it’s never acceptable for us to be unguarded,” Kang said at a news conference in Seoul. “At the same time, if we manage well the situation from now until key events in October, I think there could be room for diplomacy to be activated for denuclearization dialogue,” she added, referring to the Oct. 4 anniversary of a watershed inter-Korean declaration and Oct. 10 anniversary of the founding of the North’s ruling Workers’ Party. She acknowledged that the administration has, since it took off in May, been facing “extremely difficult” circumstances due to an ongoing, various series of the North’s ballistic missile tests, which put to test the new government’s resolve to respond. North Korea has since test-fired two ICBMs and carried out other provocations including shorter-range missile experiments and a drill designed to seize some South Korean border islands in the West Sea. “We’re in consultations with the US on ways to boost the effectiveness of sanctions before and after the UN Security Council adopted a new resolution (early this month), and our government will make an announcement in the near future,” she said. Yet she laid heavy emphasis on dialogue, although the regime has openly brushed off Seoul’s pursuit of military and humanitarian talks. This appeared to have taken into account the Donald Trump administration’s recent softened tone toward Pyongyang, with top diplomatic and security officials and military commanders relaying calls for a diplomatic solution to the drawn-out standoff. Hopes for a turnaround in the mood accelerated after North Korea fired three short-range rockets into the East Sea on Saturday in an apparent display of force against an ongoing South Korea-US military exercise. The relatively weaker response prompted Cheong Wa Dae to speculate that Pyongyang might now move toward dialogue. Trump, for his part, said last week that Pyongyang is “starting to respect us. Secretary of State Rex Tillerson said “some dialogue” is possible if the regime shows restraint. In an op-ed in the Wall Street Journal early this month, Tillerson and Secretary of Defense Jim Mattis singled out a cessation of provocative threats and weapons tests as a “sincere indication” of its “good faith” for talks.